Evan Medeiros, Asia chief on the National Security Council, stepped down on June 4. Once again, the Obama administration is losing a key player from its Asia team. Evan Medeiros, the senior director for Asian affairs on the National Security Council, stepped down Thursday, to be replaced by Daniel Kritenbrink, currently the deputy chief of mission at the United States’ embassy in China. Medeiros only took over the top Asia post at NSC in 2013, but had worked on Asian affairs (particularly China issues) in the NSC since Obama took office in 2009. He previously served as the NSC director of China, Taiwan and Mongolia affairs. Alistair Baskey, an NSC spokesperson, called Medeiros a “key architect of the president’s Asia rebalance strategy” in a statement to the Washington Post. 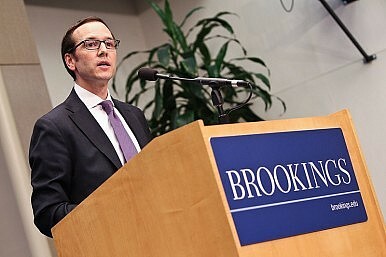 Medeiros “helped restructure the content and operation of our China policy in ways that shaped China’s choices as a rising power,” Baskey added. Colleagues of Medeiros said his departure was a personal decision. For the Obama administration, the change represents another shake-up in an Asia team that has seen its share of turnover. In 2011, the Obama administration lost two of its top Asia advisors – then-NSC Asia director Jeffrey Bader and then-Deputy Secretary of State James Steinberg — in quick succession. Kurt Campbell, who became assistant secretary of state for East Asia and Pacific affairs in 2009, left the administration in February 2013, shortly after Hillary Clinton (who is often given much of the credit for jumpstarting the “rebalance to Asia”) stepped down as secretary of state. Daniel Russel, who took over from Bader at the NSC before moving to the State Department to replace Campbell, is one of the few figures providing continuity. Meanwhile, Asia analysts also bemoan the fact that top administration officials with a unique interest in Asia and China have consistently been replaced by those with interests elsewhere. Clinton and former National Security Tom Donilon in particular were both keenly interested in China and Asian affairs; the perception is their replacements (John Kerry and Susan Rice, respectively) are returning to the historical U.S. focus on the Middle East and Europe (especially Russia). The timing of this particular shake-up – three month before Chinese President Xi Jinping pays his first state visit to the United States – has some analysts worried that U.S.-China diplomacy will stall out at a critical time. With tensions riding higher than ever over the South China Sea disputes, the United States and China need some positive momentum for their relationship. Other observers are taking Medeiros’ departure as another sign the Obama administration “has a very weak Asia team,” as Greg Sheridan, foreign editor for The Australian, put it. Sheridan expresses his concern that top Asia posts are going to career diplomats rather than to political heavy-weights. “In national security, diplomats should be on tap, not on top,” Sheridan writes, attributing the quote to a Washington insider. Medeiros’ departure is unlikely to affect Asia policy, though changes seem to be in the works — the administration is reportedly already weighing a tweaked approach to the region, including more robust response to perceived Chinese aggression in the South China Sea.